We've got a brand new High School Math Solution! Click here to learn more about the incredible team that creates our instructional materials. Our student edition is now one volume with assignment and practice pages built into every lesson. We incorporated feedback from teachers across the country to make our textbook more user-friendly by providing detailed facilitation notes, differentiation strategies, and ELL tips right into the lessons as well. 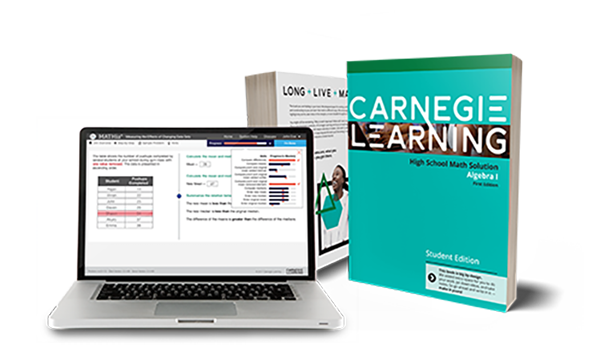 All below grade level content has been removed and will be available via the Carnegie Learning Resource Center, making the textbook smaller and more manageable for students and teachers. We've also reorganized the mathematical content to better align with standard and assessment documents. Spanish versions of the Student Editions will be available on the Resource Center and both MATHia animations and Unit Overview videos will feature Spanish closed captioning. Why is this Module named … ? What is the mathematics of … ? How is this module connected to prior learning? When will students use knowledge from this module in future learning? How is this topic organized? What is the entry point for students? How does a student demonstrate understanding? What is this topic important? How do the activities support the SMPs? The Teachers Implementation Guide includes suggestions for grouping students and other great resources to support collaborative learning. What representations will my students be using? How does this apply to STEM careers? That's not all! Click here for the full list of improvements we've made to the high school textbooks. Click here to learn more about the improvements we’ve made to our powerful math learning software.